Note that changes in crude prices tend to lead factory orders (ex- the volatile transportation sector) by about one month. 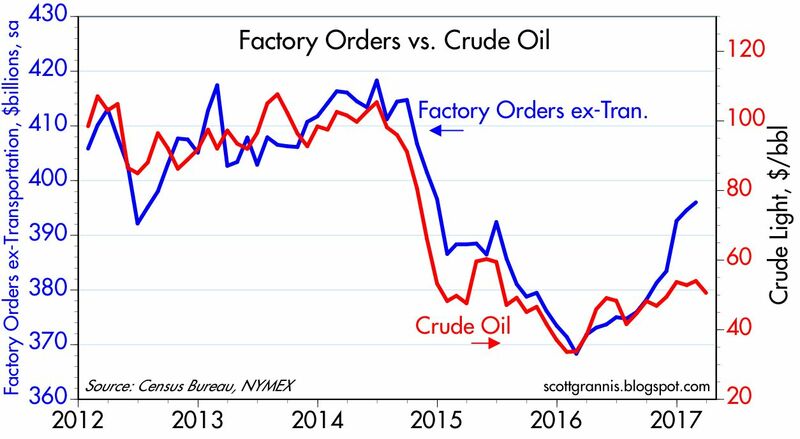 Crude prices bottomed about a year ago, and since then factory orders have risen almost 8%. In the six months ending February, factory orders are up at an annualized rate of almost 11%. That's significant. The positive effects of cheaper oil prices on demand (if you spend less on energy you can spend more on everything else) are now far outweighing the negative effects of lower oil prices on drilling and manufacturing activity. The problems of the oil patch have faded away and the economy is now enjoying a new spurt of growth thanks to cheaper energy. I don't get it; you've shown a 5 year trend that then, without reason, breaks down. Either there was real causation or not! I suspect the answer lies with a longer series...maybe. Lower oil prices beginning in 2014 damaged economy, but rising oil prices are good now because they are lower than in 2014. There must be an emoji for that. Let me clarify what I'm trying to say here. Lower oil prices initially were bad for the economy because they caused a massive retrenchment in the oil sector. Lots of layoffs, lots of cancelled orders, lots of losses for exploration firms. These cutbacks and losses had a ripple effect throughout the economy that was much stronger than the positive effects of falling prices on the rest of the economy. I think I as well as many others thought that lower oil prices were an unalloyed good, when in fact they were bad, at least for a time. But now that the oil industry has adjusted to lower prices, after they have cut back, the positive effects of lower oil prices are showing through. The productive side of the economy suffered more from falling oil prices than the consumer, in other words. But sometime last year the pain suffered by producers ceased as oil prices stabilized. Now we see that with prices still vastly lower than they were a few years ago, consumers have more spending power and economic activity in general is less expensive (because energy is cheaper) than it was a few years ago. What is interesting also is that the shale guys may have figured out how to make money at $50 a barrel. Natural gas is everywhere too. T. Boone Pickens (yes, he is still kickin') is making progress with his Clean Fuels Energy outfit. Look for big rigs running on CNG and LPG. So, we may be entering an era of relative energy abundance. Tesla stock rising. Their big product is battery cars, and their second line is solar-batteries for homes, which get cheap and reliable power from natural-gas powered electrical grids. Tesla now worth more than Ford. Tesla makes 100% American-made cars, btw. Side note: If batteries become cheap enough, a new world may open up. A well-maintained battery car will last longer than its owners. Like I said, interesting times. Keep in mind that the price of any commodity, including gold, declines if/when business activity weakens.